David Andrew’s election as a senator in 1925 points to some degree of dogged determination for it was his sixth attempt to enter Parliament either at the federal or state level. Born in Castlemaine, Victoria, on 10 November 1866, the son of James Sprunt Andrew, a stonemason and later an auctioneer, and his wife, Augusta Arabella, Andrew attended state schools before beginning a fitter’s apprenticeship. After four years, he abandoned his indentures to enter his father’s Bendigo auctioneering business of which he assumed control in 1908. In youth and early manhood, Andrew was a keen cricketer and footballer, although his most enduring interest was the Fire Brigade. Andrew captained the Bendigo brigade for many years, serving as president of the Victorian Country Fire Brigades Board. Andrew’s first taste of politics was as a Bendigo city councillor. He served three terms as mayor of the city: 1909–10, 1913–14 and 1920–21. But the attraction of state and federal politics proved stronger. 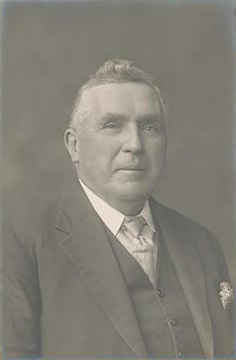 He stood unsuccessfully as a conservative candidate for the seats of Bendigo West, 1911 and 1914, Bendigo East, 1915 and again for Bendigo West, this time as an Independent, in 1920. His attempt to enter the Senate in 1922 also failed. In 1925, however, he was elected to the tenth Parliament as a Country Party senator for Victoria, his term of service due to expire on 30 June 1929. Throughout his Senate career, he enunciated a political philosophy that was by turns conservative and radical. Most of Andrew’s parliamentary utterances were brief and to the point. He was a proponent of a national housing scheme to expand home ownership. Andrew welcomed government proposals for an unemployment insurance scheme and improved rural roads to benefit primary producers. He remained convinced that Australia’s prosperity lay with primary industry. While suspicious of measures (including immigration) designed to shift development towards manufacturing, he was in favour of migration if it assisted primary producers and was enthusiastic about the Big Brother movement. However, he considered that the ‘best immigrant’ was ‘the Australian baby’. As a vice-president of the River Murray Waters Conservation League, Andrew regarded ‘the locking of the Murray’ as ‘a legacy that coming generations will deeply appreciate’. A passionate advocate of assistance to the aged, he was concerned with the administration of the old-age pension scheme by public servants, affirming that it was ‘the intention of Parliament to deal with these old people in a sympathetic manner’. Andrew also supported attempts to address major public health problems such as tuberculosis, which was rampant in Bendigo and other mining centres. As well as advocating improved scientific research into these scourges, he argued that the treatment of tuberculosis should include adequate provision for dependants. A champion of protection, especially for primary industry, principally through the vehicle of bounties, Andrew remained critical of ‘manufacturers who can get the ear of Ministers or certain honorable senators’, and secure ‘an excellent opportunity of obtaining even higher protection’. He favoured a larger motion picture industry in Australia. He supported attempts to simplify the method of election of senators and to improve the mechanics of voting, especially in the area of postal voting: ‘Sick persons should not be disenfranchised, but should be provided with every facility for voting’. Outside Parliament, Andrew’s was a life characterised by public service and heartfelt concern for the less fortunate. A number of institutions, such as the Bendigo Benevolent Asylum, the Bendigo Hospital (of which he was an honorary life governor) and the Bendigo United Friendly Societies’ Institute and Dispensary, benefited greatly from his fund-raising efforts. He also chaired the local citizens’ patriotic committee, which raised funds to assist soldiers during World War I, and organised charitable appeals by bodies like the Red Cross. Andrew was proud of his Scottish heritage; he was a member of the Council of the Victorian Scottish Union, chief of the Bendigo Caledonian Society and founded the Scots’ Society in Bendigo. Andrew died at his Bendigo home in Myrtle Street, Golden Square, on 18 November 1928. Weakened by ill health, he had decided not to renominate for the federal election, which was held the day before his death. He was married twice: at the age of twenty-one to Myra Swan McIntyre who died in 1892; and, a year later, to her sister, Clara McIntyre. After a funeral conducted by the Fire Brigade, Andrew was buried in Bendigo Cemetery. Andrew outlived his second wife by only a few weeks, and was survived by one son of his first marriage, James, and the two daughters of his second, Marjorie and Dorothy. Richard Abbott, who filled the Senate casual vacancy created by Andrew’s death, stressed that Andrew’s fund-raising for charity had made his name ‘a household word’ in Bendigo. CPD, 4 May 1928, pp. 4658–4659, 14 January 1926, pp. 32–34, 2 December 1927, p. 2491, 14 January 1926, p. 34, 10 August 1926, p. 5138, 22 July 1926, pp. 4454–4455. CPD, 5 August 1926, p. 4912, 10 August 1926, pp. 5101–5102, 5 August 1926, p. 4920, 17 November 1927, pp. 1526-1527, 17 May 1928, p. 4978, 4 June 1926, p. 2647, 1 July 1926, p. 3695, 2 March 1927, p. 19, 7 October 1927, p. 350. Age (Melbourne), 19 November 1928, p. 13; Argus (Melbourne), 19 November 1928, p. 11; CPD, 6 February 1929, pp. 13–14, 32. This biography was first published in The Biographical Dictionary of the Australian Senate, vol. 1, 1901-1929, Melbourne University Press, Carlton South, Vic., 2000, pp. 325-327.